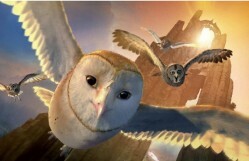 Below you can read the review of Legend of the Guardians: The Owls of Ga’Hoole by FILMCLUB member Erin Stott aged 9 from Heage Primary School in Belper. 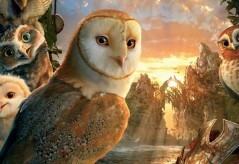 Legend of the Guardians is based on two owlets who go to find the guardians if Ga’hool. Soren and Kludd are brother owlets. They have a little sister called Eglantine. Soren and Kludd fell out of a tree and got taken to an evil queens palace. When Soren and Rludd get taken to see the queen of evil they get separated. One will become a great soldier and the other a slave. Soren managed to escape and went to find the guardians. When Soren found the guardians they went to battle with the evil king Metalbeak and rescued to owlets from the queen of evils keep. One of them Sorens sister Eglantine. Realising the guardians were in danger Soren flew to battle and fought with Kludd. In the battle Soren saves the guardians to fight back. The battle between good and evil is a great scene of fighting and has scary parts. Kludd falls into a firey wood – is this the end of him? It was the end of the war. The very end marked a celebration but who was the winner good or evil? I really enjoyed this film because the owls looked so real. I hope you enjoy it too.